Do you need exquisite, personalized favors for your wedding guests? Adorable baby or bridal shower favors? Unique thank you gifts for your birthday party or anniversary party guests? A premium corporate gift to present to your clients or employees? Look no further. We will work with you to create a custom soap that reflects your personal style and the essence of your event! Choose one of our luscious goat milk soaps. Supply your own fabric for the wrap. We can choose a wrap for you. Supply your own graphic and text for the label. Finish it off with a pretty ribbon and a clear bag. Click the picture for a large photo of the finished product! 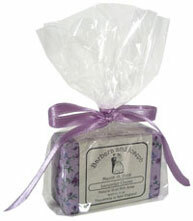 Add a pretty ribbon and a clear bag to each soap for $0.30 ($0.15 if you provide the ribbon). Let us make your special occasion just a little more memorable. Contact Renee to order your personalized soaps today! Our natural skin care products are available to retailers at wholesale prices. We offer top quality products, low minimum purchase quantities and fast, friendly service. We can work with you to develop private label products and packaging to suit your needs. This includes incorporating your company's graphics on the labels. We can provide you with unwrapped/unlabeled products for you to package yourself. We can incorporate your own herbs and oils into custom goat milk soaps made just for you. If you are looking for products that we don't currently offer, please let us know. We may be able to develop a product to suit your needs.